Religion attempts to answer questions of “Ultimate Concern” in a similar way to what science seeks to explain. We tend to think that science offers up certainty, but the closer we look we find that any certainty that science brings us also brings us more questions. I find that both of these approaches are reaching for the same thing and both require us to let go of solid footing and take a leap. Last weekend, I was listening to a radio program, “To the Best of our Knowledge,” and twice in the same episode they mentioned a shift in our cultural consciousness that emerged during the last century when we saw ourselves from space. 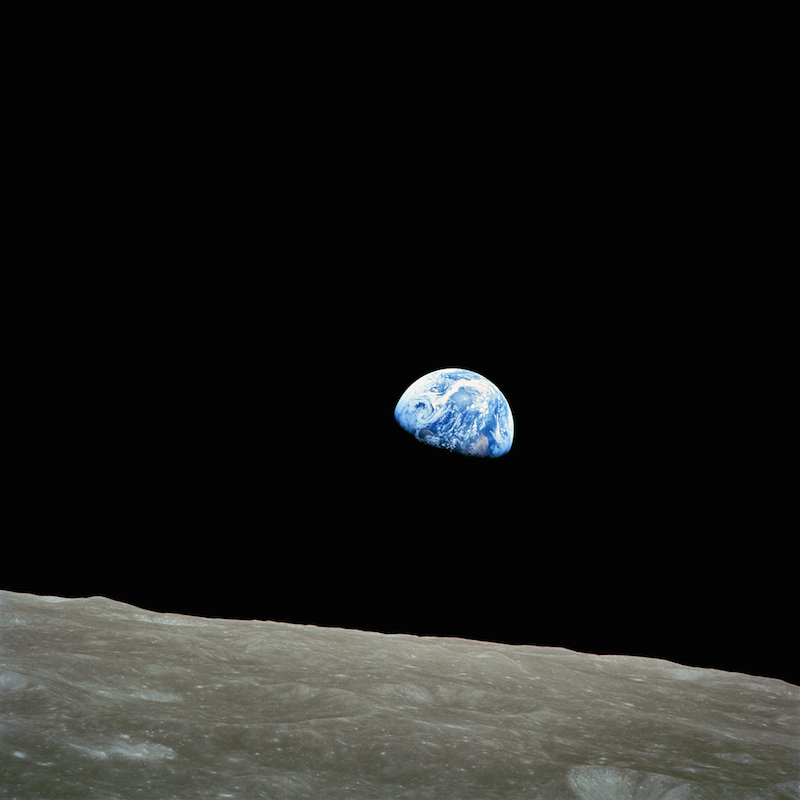 The photograph, titled “Earthrise,” presents a view of the planet we had never seen before. For the first time we were looking at the earth with no borders in a space with no boundaries. We saw that the planet we share, with its large mountains and vast oceans, is just a fragile sphere. Some have argued that this scene helped to impress more feelings of solidarity between us but also a deep sense of vulnerability. We really may just be this marble floating in vast nothingness. The worst part about it: the more we find out about space, the more we see how much we don’t know. This is a humbling perspective; to really see ourselves, we must recognize how small we are compared to the almost endless space around us. When my thoughts go to such truths, the issues in my life that seem important become trivial in comparison. It’s similar to when we feel we catch a glimpse of the divine or sacred in our everyday lives. The line between science and spirituality has never been closer than it is now. We’ve been finding that more and more the foundational questions of science (where does the universe end? what are electrons made of? where did we all come from?) fall short of what science can yet explain. What makes a spiritual answer to a question different from a scientific one is that uncertainty is trailing close behind. Spiritual beliefs are predicated on grounds that there is no sure answer; spirituality in some sense is our response to what can be crippling uncertainty. Science’s main goal is to dispel uncertainty, but there are some questions that science cannot answer yet, and may never be able to. I am not saying that one approach is better or more adequate than another, but it seems that both involve some degree of faith. Faith doesn’t have to mean believing in a god or some ultimate power; we put faith into secular situations all the time. We trust that the other cars next to us on the highway will stay in their own lanes, we trust that flipping the light switch will turn on the light, and we trust that science is giving us the whole story. Most of the time it is, but we have seen that what science teaches as true may not always stay true. For example, there was a time when the whole world believed that the Sun rotated around the Earth and the Earth was the center of the universe. It appeared logical from what we could observe from our place on earth. Even when we had proof that the sun was actually at the center, the belief in this “truth” – of our place in the cosmos – was still strong and remained so for some time. This new truth of the sun at the center challenged both the authority of science and religion. To be able to accept a new paradigm, we had to first admit that our former belief was indeed uncertain. We don’t like uncertainty, and understandably so. But there is this beautiful thing that happens when we are able to suspend our belief in a sense of concrete certainty. Suddenly, more becomes possible. When we are able to no longer subscribe to the belief that we must make six figures to be happy, then we can see how much something simple like playing cards with our kids brings a deeper quality of joy. We feel best when we have a sense of security in our lives, but it’s important to recognize that it’s our belief in the security that provides that good feeling, not the security itself. We would be tormented all day if we continuously thought about what could happen to our spouse on their way to work. But in the same sense, none of that matters if there is an asteroid heading straight towards our defenseless planet. This is the shift that the “Earthrise” ushers in reminding us of the tenuousness of our existence. Our ability to turn off those thoughts, shift our perspective and trust that it really will be okay is what allows us to get through our day. Both science and spirituality are places we turn to for answers, and for the most part we get the answers we seek. However, we must see that truth may change depending on which angle we approach our questions. When we see that science and spirituality is so dependent on our perspectives, we start to open to the truth that we cannot know truth in its totality. So in each moment we are leaping, whether we realize it or not. "Earthrise" photograph taken by Apollo 8 member William Anders on December 24, 1968. Image courtesy of Wikimedia Commons. Great piece Nyssa~it’s so true that everyday, without even realizing, we employ faith within the most mundane and secular activities… I have absolute faith that in the midst of these cold mornings, the electricity (from wherever it comes and in the unknowable way it works) will continue to generate the power my hot-water heater needs to provide me with hot showers!